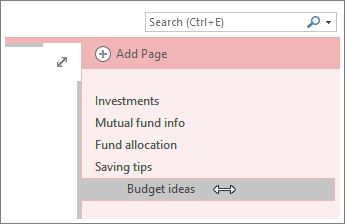 Subpages are a good way to group and organize notes in OneNote. 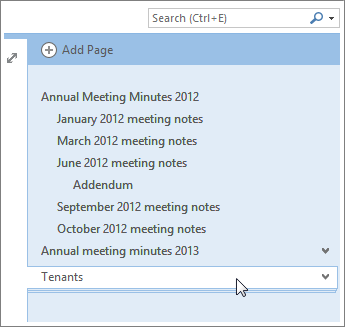 For example, if you have annual and monthly meeting notes, the annual meeting notes can be a main page and you can demote the monthly meeting notes so they become subpages. Before you create a subpage, you’ll need at least two pages: A page that will be your main page, and a page that will be the subpage. If your notebook is empty, you can add pages. Move the mouse pointer over the page tab on the right side of the page. Drag the page tab to the right until the title is indented. Note: You can have two levels of subpages. Drag a subpage to the left to indent it further, or drag it right to make it a main page again. Main pages can be collapsed to hide all levels of subpages under them. A chevron on the right side of the page tab means that the page has subpages. If you click a page that has subpages, lines representing stacked subpages appear under the page tab. Click the chevron next to the page tab on the right to expand or collapse the subpages under it. If the number of notebooks and pages is making it harder to find what you’re looking for, you can search notes and navigate results. Another way to stay efficient is by creating new notebooks.